You just gave your all. You put everything you had into Fran and crushed it. Maybe you even did it Rx sub six minutes. Your lungs are on fire and you can’t seem to get enough air into them to keep up with your rapid heart rate. You want to get all your systems back to normal, but what is the best way to catch your breath? What if this was a partner competition and you only had a few seconds to recover while your partner cranked out their reps? Does one position offer more efficient recovery over another? My earliest memories of running in gym class involved instructions to stand upright with hands on our heads to recover after a sprint. This was echoed by my lacrosse coach in high school. We never really got an explanation as to why. Olympians seemed to adopt that pose on the track, so we never really questioned it. However, like most everything in life, studies have been done on this, so let’s see what science has to say. A 2014 study by Western Washington University analyzed various measurements taken from athletes such as rate of CO2 elimination, heart rate, lung capacity, and blood flow, all important body functions that determine how fast we recover from exercise. The study took two groups of participants and had them each run on a treadmill for 4 minutes followed by 3 minutes of rest. This interval was repeated four times. The first group was instructed to assume a recovery position of hands on heads, standing upright. The second group assumed a hands on knees position. The study results showed a significant advantage to using the hands on the knees position to recover over hands on the head. Heart rate was on average 22 beats per minute slower and tidal volume, a measure of lung capacity, was significantly better with hands on the knees versus hands on the head. This indicates a higher volume of oxygen being able to be taken in during rest in the hands on knees position. The reason for the different results in the positions is likely due to relaxation of the diaphragm as the core loosens as the majority of the body’s weight is supported by the legs and arms, which are large, strong muscle groups. Additionally, the lungs are able to expand more in a hunched over position compared to an erect stance, and this allows each breath to carry more oxygen to the bloodstream. While the numbers prove that having your hands on your knees is the better of the two positions for recovery, it is important to keep your head above your heart. If you let your head dip below the heart, you will decrease blood flow to the brain and pass out. Your recovery will then be completed on a stretcher. But what about lying down, you ask? A 2013 study at Samford University in Birmingham, Alabama analyzed the data from subjects who performed active recovery of walking around after sprints to that of those who assumed a supine position on their back after those same sprints. The measurements showed a quicker reduction in heart rate of those who lied on their backs to those who walked around. It was concluded that lying down allows the blood to circulate with less resistance from gravity. Also, along the same reasons as above for the hands on the knees results, lying down allows the core to relax and this eases tension on the diaphragm, allowing breathing to happen more easily. There is one vital safety note for those of us who choose to recover on our backs. Lying down can aggravate some heart and related circulation issues, potentially placing the athlete at serious cardiac risk. For this reason, it is suggested you avoid the supine position if you know you suffer from a cardiac or circulation issue. It is also the reason coaches check on those who are lying down to make sure they are still alive. 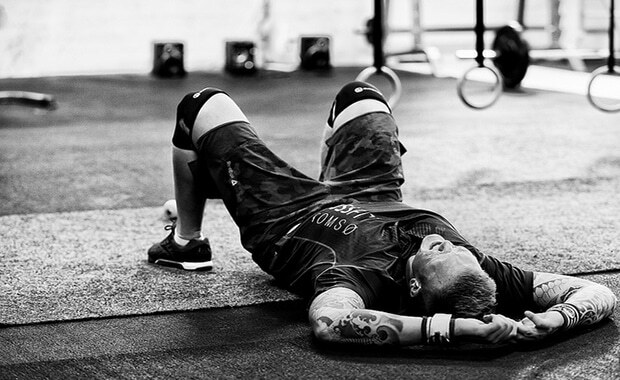 One athlete on the CrossFit Forums suggested that if you are lying down and suffer a cardiac event, you may die right there without anyone seeing or knowing. If you have a heart attack while standing, your rapid descent to the floor will likely attract potentially life saving attention. While maybe not official medical advice, it makes sense to me. Hands on the knees it is.